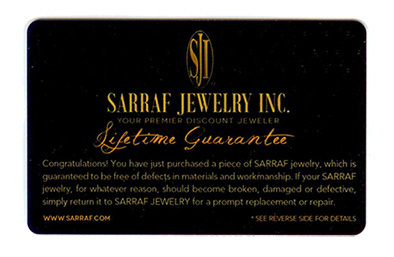 When you buy your jewelry from SARRAF.COM, you buy with confidence. Sarraf.com Jewelry is guaranteed to be free of defects in materials and workmanship. If your SARRAF jewelry, for whatever reason , should become broken, damaged or defective, simply return it to SARRAF JEWELRY for a prompt replacement or repair. All rings purchased from SARRAF is covered for lifetime resizing and refinishing. 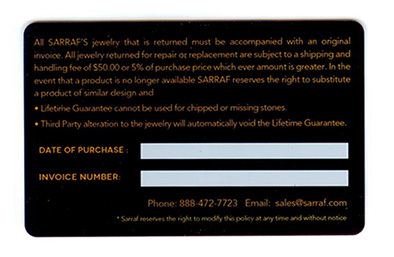 All SARRAF’S jewelry that is returned must be accompanied with an original invoice. All jewelry returned for repair or replacement are subject to a Shipping and handling fee of $50.00 or 5% of purchase price which ever amount is greater. In the event that a product is no longer available SARRAF reserves the right to substitute a product of similar design and quality. Lifetime Guarantee cannot be used for chipped or missing stones. Third Party alteration to the jewelry will automatically void the Lifetime Guarantee.